while the germ and bacteria killing compounds are working. 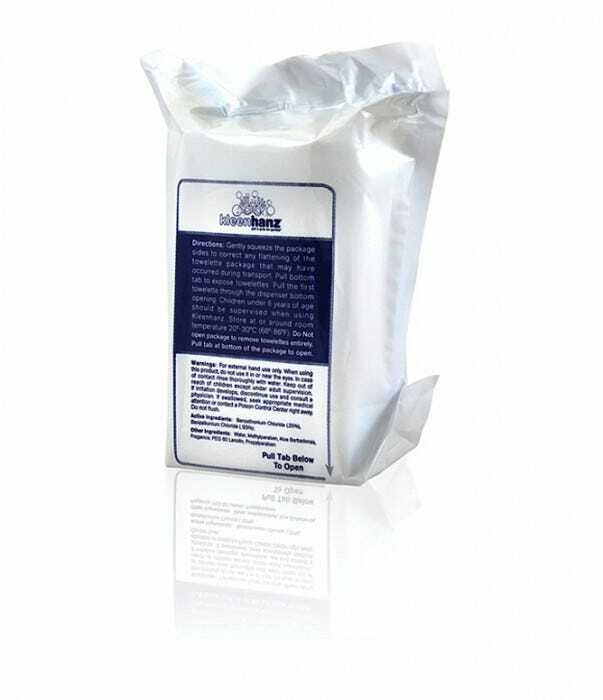 An alcohol-free hand cleaning and sanitizing wipe that kills 99.99% of germs and bacteria on contact. When you wipe your hands with a Kleenhanz towelette, the friction is cleaning your hands while the germ and bacteria killing compounds are working. Your hands will feel moisturized and will have germ killing protection for over two hours after use. 250 count refill listed as USDA BioPreferred. Kleenhanz® is an alcohol-free hand cleaning and sanitizing wipe that kills 99.99% of germs and bacteria on contact through the use of antimicrobial and hypoallergenic agents Benzethonium Chloride (0.25%) and Benzalkonium Chloride (0.125%) with a touch of lanolin and aloe to moisturize your skin. This newer science utilizes quaternary compounds (detergents) rather than the older methods of ethyl alcohol to kill germs and bacteria, eliminating the harsh side effects of alcohol-based hand sanitizers. When you wipe your hands with a Kleenhanz® towelette you are cleaning, disinfecting and moisturizing while also providing germ killing protection for over two hours. Yes! Not only is Kleenhanz® effective in killing germs, bacteria and virus on contact, it leaves your skin feeling soft and fresh. How does the Kleenhanz® system differ from other products? Alcohol based liquid hand sanitizers do not clean hands. The original liquid hand sanitizers were developed for hospitals where doctors washed and scrubbed their hands until they were clean and dry and then they used a liquid hand sanitizer to kill any remaining germs. Today, people have the misconception that using a liquid hand sanitizer on dirty hands will somehow clean their hands. Using a liquid hand sanitizer on dirty hands does not clean your hands, but only moves the dirt and grime around and reduces the effectiveness of the alcohol. The second the alcohol dries, its germ killing work is done and your hands are still dirty. 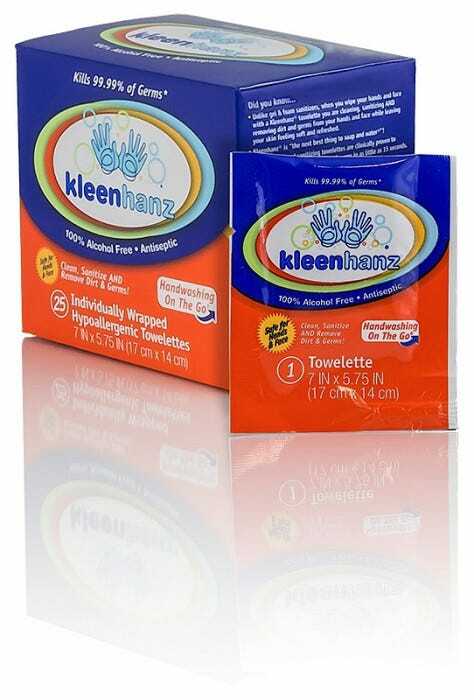 When you wipe your hands with a Kleenhanz® towelette, the friction is cleaning your hands while the germ and bacteria killing compounds are working. Your hands will feel moisturized and will have germ killing protection for over two more hours after each use. Kleenhanz® can also be very effective as a surface wipe for things like door handles, shopping carts, steering wheels, key boards, restaurant menus and lots more. The whole point of good hand hygiene is to make repeated efforts to clean your hands throughout the day, but repeated use of an alcohol based hand sanitizer is so harsh on hands that it discourages most people from frequent use. Kleenhanz® will clean and sanitize your hands, protect them for over two hours and leave them feeling soft and fresh. Use Kleenhanz® anywhere, anytime, all the time! Is Kleenhanz® safe to use? Yes! Kleenhanz® is a water-based solution (over 99% water) that contains compounds commonly used in health care settings. Kleenhanz® does not contain alcohol so there are no increased flammability concerns and there is no irritation to open cuts or wounds. Kleenhanz® is safe to use on children too! Will Kleenhanz® dry out my hands? No! There is no alcohol in Kleenhanz®. Alcohol is a drying agent. Instead, Kleenhanz uses antimicrobial and hypoallergenic agents Benzethonium Chloride and Benzalkonium Chloride with a touch of lanolin and aloe to moisturize your skin. This newer science utilizes quaternary compounds (detergents) rather than the older methods of ethyl alcohol to kill germs and bacteria, eliminating the harsh side effects of alcohol based hand sanitizers. When you wipe your hands with a Kleenhanz® towelette you are cleaning, disinfecting and moisturizing while providing germ killing protection for over two hours. Is Kleenhanz® expensive compared to liquids, gels and foams? No! Depending on the dispenser you choose, single Kleenhanz towelettes are just pennies each. Compared to liquid hand sanitizers we believe Kleenhanz towelettes are more cost efficient than squirts from a liquid, gel or foam bottle. Kleenhanz can be effective as a surface wipe as well. Do the Dallas Cowboys really use Kleenhanz®? Yes! The Cowboys like Kleenhanz® so much that they made Kleenhanz® the official hand cleaning and sanitizing wipe of the Dallas Cowboys®. The Cowboys have Kleenhanz® in every player locker, in their weight and training rooms in Valley Ranch and at their new stadium. Cowboy players are determined to stay healthy and they know the importance of keeping their hands germ-free. "Kleenhanz® is so much more than a hand sanitizer! Because it is alcohol free and effective on many forms of bacteria, including staph, we have seen amazing results using the towelette on faces to treat acne. Anyone who has suffered through the stinging, smelly and drying effects of alcohol will love how Kleenhanz® makes you feel. We also wipe down all of our patient rooms and equipment, so it is handy as a surface wipe as well." "Over the past several years the incidence of severe bacterial infections has become prevalent in the athletic arena. The strength & conditioning environment is one where this problem can become epidemic, Kleenhanz® offers my staff and players an easy and efficient way to combat this problem and has become part of our daily routine." "I founded Oklahoma Sports Sciences and Orthopedics in 1995. The Kleenhanz® products have been very helpful in treating athletes and patients with knee and shoulder injuries! It is safe and very effective! It also promotes awareness to me and my staff of the importance of cleansing hands between patients! I highly recommend this product!" "I have used Kleenhanz® in my office for over 18 months now where my nurse and I use it all the time. We love the fact that Kleenhanz® works so well without drying out our hands, especially in the winter months. I have also recommended Kleenhanz® to patients with Eczema and suggested that instead of scratching, they rub it on itchy skin areas. 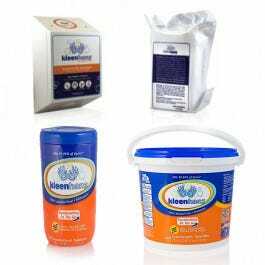 Kleenhanz® does not burn or sting and the mild detergents can be effective on the skin irritation. A father of one of my patients suggested this after seeing it work on his son." 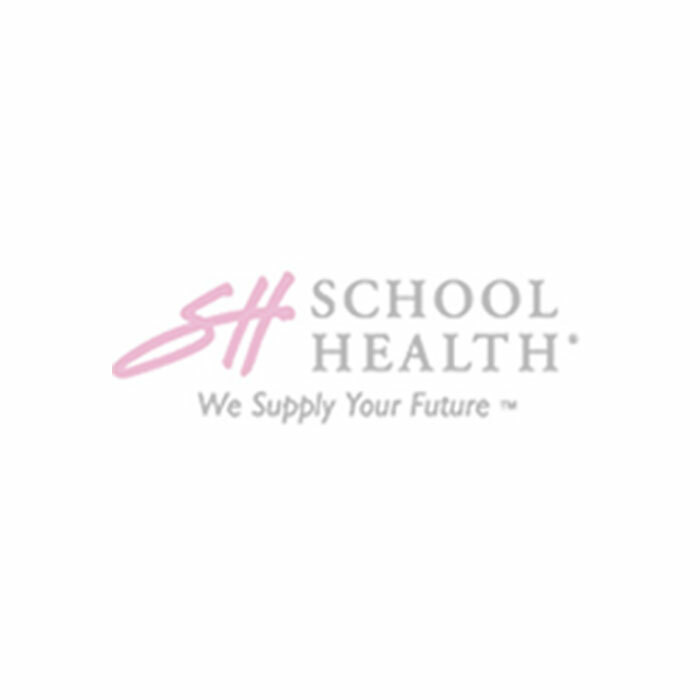 Long term, frequent use of alcohol based hand sanitizers can cause skin irritation. Alcohol solubilizes (dissolves) and strips away sebum and lipids that guard against bacterial infections of the skin. Extensive use of alcohol-based hand sanitizers actually increases the skin's susceptibility to infection by transient disease-causing bacteria. This situation can increase the chances of spreading disease-causing microorganisms. There is no alcohol in Kleenhanz®. Instead, the two primary ingredients are quaternary compounds, Benzalkonium Chloride and Benzethonium Chloride. Kleenhanz® kills 99.99% of germs on contact and provides germ killing protection for over two hours while leaving your hands feeling soft and fresh. Kleenhanz® does not dry out your hands, does not sting on open wounds and does not smell bad. Kleenhanz® is 99.99% effective without all of the harsh side effects of alcohol. Kleenhanz® is also very effective as a surface wipe killing 99.99% of germs, bacteria and virus on hard surfaces, ncluding MRSA, H1N1, Hepatitis, Herpes, HIV, Chlamydia and more. Try it once and you will never go back to liquid hand sanitizer!